These cookies are essential to allow you to browse the site and use its features. Without cookies, some features may not be accessible or may not function properly. The strictly necessary cookies are used to store an identifier in order to identify the user in a unique way with respect to other users, in order to provide the user with a consistent and precise service. These cookies are used by partners of the site www.crocemalta.com/en, in order to propose our advertising messages when you visit other sites, showing for example the latest products you have viewed on the site. These cookies can also be used to show products that may be of interest to you or similar to those you have previously viewed. The use of these cookies does not imply the processing of personal data, but may allow the connection to the browser installed on your computer or other devices used during navigation. They can also be used to avoid offering a previously proposed service to a specific user again. Furthermore, these cookies allow the site to keep track of the user’s choices. The information collected by these cookies are anonymous and can not lead to user behavior on other sites. Privacy laws provide users with the option of disabling cookies (opt out), which are already installed on their device. This option applies to “Technical Cookies” (art. 122 of Italian Privacy Law) and other cookies, which were previously accepted by the user (opt in). The user can disable and/or delete cookies in the browser settings (opt out). 1. Open the Internet Explorer by clicking the ‘Start’ button and clicking on Internet Explorer. 2. Click on the ‘Tools’ button and on ‘Internet options’. 3. Click on the ‘Privacy’ tab, under ‘Settings’, move the slider to the top to block all cookies or to the bottom to allow all cookies. Click on ‘OK’. 4. Blocking cookies might prevent some websites from displaying correctly. 1. Click on the ‘Menu’ button and choose ‘Settings’. 2. Go to the ‘Privacy’ section. 3. In the ‘Firefox will:’ section choose ‘Use custom settings for history’. 4. Uncheck the box at ‘Accept Cookies from sites’. Click on ‘OK’. 1. Choose the Chrome ‘Menu’ item. 3. At the bottom of the page choose ‘Show advanced settings’. 4. In the ‘Privacy’ section click the ‘Content settings’ button. 5. Choose ‘Block sites from saving any data’. 2. Change which cookies and website data are accepted: Select a “Cookies and website data” option: Always block: Safari doesn’t let any websites, third parties, or advertisers store cookies and other data on your Mac. This may prevent some websites from working properly. 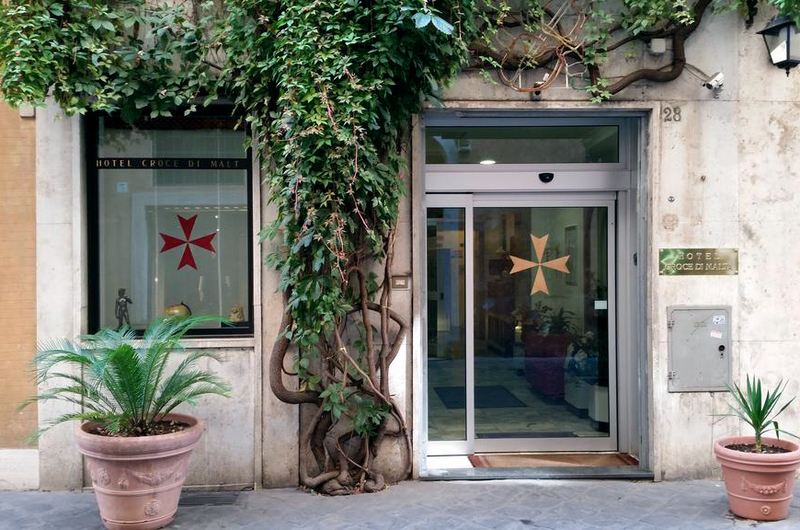 The 2-star hotel Croce di Malta is housed in a 15th century building and is located in a strategic position in via Borgognona, between via Condotti and via Frattina. This location, in addition to being in a quiet pedestrian street, is less than 100 meters from the Spanish Steps. The hotel is therefore the ideal starting point for those wishing to stay in an economic structure, in the historic center of Rome. Copyright 2018 Ⓒ by Hotel Croce di Malta S.r.l. / Legal info: registered at the number RM-1305196 at the register of companies in Rome. Registered office in Via Borgognona 28 - 00187 Rome (RM). VAT and F.C. : 11471081007 - Share Capital: € 10,000.00 f.p.